The Batman - The Brave and the Bold line includes not only a selection of excellent figures in both the 'basic' and 'action league' scales, but also a number of great vehicles. 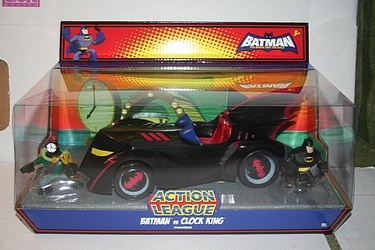 Well, what more iconic vehicle can you get in a Batman line but his 'mobile, and here we have Bats and Clock King packaged with the Batmobile, in Action League scale. Check out this great set by clicking on the image below - I especially like the design of Clock King...great figure!